Dried shark fins at a market in Malaysia. I spent a large portion of the summer of 1999 sitting on a rocking boat in the North Atlantic searching for Basking sharks. I wanted some great shots of these huge fish for my collection, and I was determined to get them. But things weren’t going my way. First, they were late arriving (a month late, in fact). Then I had bad weather. The sharks get their name from the fact that they often “bask” at the surface. Actually, this basking is feeding. The shark skims the surface with it’s mammoth mouth wide open to collect plankton. But they only surface feed in calm weather. I knew there were sharks around, but who can find them if they aren’t at the surface? I couldn’t chum for them because they eat plankton. So all I could do was wait and look through my binoculars, wondering what I would do if I didn’t see any sharks at all. My mind would drift to thinking about lunch. At last I found a shark. I got suited up and jumped in the water. I got right in front of the shark and watched it swim by, like an enormous aquatic freight train. The massive tail swished mightily back and forth, and I was caught in the vortex, tossed to the side. The tail was easily six feet high. As it disappeared into the depths, I caught my last glimpse of a shark for the trip. That would be my only encounter in four days at sea. People like me who seek adventures with sharks know only too well the dilemma of getting sharks to approach divers. It takes a lot of patience and luck. Unfortunately, the problem is getting worse, since sharks are becoming more and more difficult to find. In the late 1980’s, as much of the waters of the United Stated became unproductive fisheries due to overfishing, the U.S. government encouraged fishermen to go after “underutilized” species like sharks. Fishermen used to call them “trash fish” but they became a valuable commodity when there was little else to fish for. The flesh of Mako sharks is frequently substituted for swordfish due to a similar taste and texture. 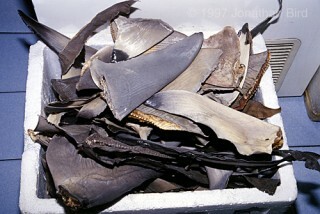 The fins of sharks bring big money in the Asian markets, where they are prized for making shark fin soup, a delicacy. But the booming days of shark fishing lasted only a few years. Suddenly, the fishery collapsed just as the one it replaced. Now our oceans face a shortage of sharks. But nobody likes sharks anyway...so what’s the difference? The difference is that an ocean without sharks is an ocean missing a critical component of the food web. As predators at the very top of the food web, sharks fill an important niche. Because sharks lack the speed or maneuverability of many fish, they go after sick or weak prey. By eating the sick and the weak, sharks keep the genetic make-up of their prey healthy. Fish that are so small we would need glasses to see them are quickly devoured by a shark, and therefore never pass on such a bad and undesirable gene. So sharks are essentially improving the health of ocean ecosystems by eating whatever they can catch (and eating what they can't catch)! This is by no means unique in the animal world-terrestrial predators perform the same role. A lack of sharks in any ocean ecosystem is a very bad sign. And what about shark attacks? Should we fear these animals? Considering that less than 15 fatal attacks on humans occur worldwide every year, shark attacks seldom happen. In fact, you are more likely to die from a bee sting! Many more sharks die at the hands of man than vice-versa. Even worse, tens of thousands of sharks are tortured every year when fishermen catch them, cut their fins off and throw them back alive to die a slow and painful death. And we’re afraid of them? On trips to dive with sharks (when I actually found some) I never felt threatened in their presence. In many cases, sharks approach cautiously and seem to exhibit true curiosity about me, my camera and my dive gear. It can be quite a thrilling and unforgettable experience to gaze directly into the eye of a passing shark, wondering what it is thinking about you. It is my hope that in the next couple of years shark enthusiasts like you and I can help to bring about a change in the public’s perception of sharks. Sharks and their direct predecessors have been swimming in the world’s oceans for well over 350 million years. Primordial sharks hunted the seas many millions of years before dinosaurs walked the Earth. Following a period of intense “evolutionary experimentation,” the basic shark we know today emerged about 250 million years ago. While sharks continue to evolve like all animals, the fact that sharks have survived for so long with the same basic design demonstrates the incredible effectiveness of their anatomy. Sharks are fishes, contained within the taxonomic class called Chondrichthyes (meaning “cartilage-fish”). This class of fishes contains over 800 species worldwide, including over 400 species of sharks and 350 species of rays and skates, which are basically just flattened sharks. Sharks and rays come in many shapes and sizes. The largest fish in the ocean is, in fact, the tremendous Whale shark, reaching about 15 m (50 feet) in length. The smallest known shark grows to only 25 cm (10 inches) long at full size. Sharks and their close relatives (rays, skates, and ratfishes) differ from the bony fishes in many ways. Among the more obvious, sharks and their relatives have cartilaginous skeletons, and lack swim bladders. The cartilaginous skeleton makes the shark more flexible than similarly-sized bony fishes. The shark’s lack of a swim bladder means that, unlike bony fishes, the shark tends to sink. A bony fish uses an organ called a swim bladder to maintain neutral buoyancy, so it can hover like a hot air balloon. The fish adds or removes gas from the bladder through its bloodstream to change its buoyancy. A shark has a large, oil-rich liver that provides some buoyancy, but not enough to keep from sinking. The Basking shark’s liver can weigh as much as 25% of the total weight of its body. To stay off the bottom, sharks have to keep moving. While the shark uses its tail fin in a back and forth motion to provide forward thrust, its pectoral fins work like airplane wings to provide lift. Like an airplane wing, as long as the fins move forward through the water, they provide lift to keep the shark up. This lack of a swim bladder is not necessarily a weakness. Bony fishes cannot ascend too quickly because the expanding gas in the swim bladder would cause it to rupture. They can only ascend as fast as they can remove the gas from the swim bladder. By not having a swim bladder, sharks can swim straight up as fast as they like without any danger of hurting themselves. Not too long ago, scientists thought all sharks had to swim at all times, not just to stay off the bottom, but to keep water moving over their gills. It turns out that many species of sharks sometimes stop swimming and rest on the bottom, gulping water to ventilate their gills. Bottom-dwelling species of sharks like the Nurse shark actually live their entire lives on or near the bottom. Sharks are a diverse group of fishes with many specializations to survive. They inhabit all of the world’s oceans, from the arctic to the tropics, from the surface to the deep-sea, and from the shoreline to the open ocean. Some species, like the Bull shark can even swim up into freshwater rivers and lakes, hundreds of miles from the ocean. Unfortunately, sharks only have a small number of offspring at a time, and they take a long time to reach sexual maturity. As a result, shark populations do not recover quickly from overfishing. Today, sharks face incredible fishing pressure from the shark-finning industry. Sharks are caught just for their fins, which are worth a lot of money as the prime ingredient in shark fin soup, popular in China and other far eastern countries. Often sharks are thrown back alive, with their fins removed, so that they die a slow and painful death. It's not only wasteful, but cruel. Today, the shark finning industry is killing sharks at an unprecedented rate to feed the demand for shark fin soup in a blossoming Chinese economy. The situation is far more dire than most people realize--sharks are critically endangered. Unfortunately, sharks are not cute and fuzzy like pandas, so it's hard to get people interested in the need to protect them. But we must. An ocean without top predators is not healthy or in balance. It might be hard to believe, but a lack of sharks in any ocean ecosystem could be disastrous to the health of ocean food chains, including the ones we rely upon for food resources. If protecting sharks for environmental purposes isn’t convincing enough, perhaps we should protect sharks for more selfish reasons—what we can learn from them to help ourselves. Research on sharks may someday provide medicines and cures for a variety of diseases. The highly-evolved immune system of sharks is strongly resistant to many illnesses including cancer. Perhaps the best argument in favor of protecting sharks is simply that they are wild animals and have just as much of a right to survive as we do. Sharks have been living on this planet hundreds of millions of years longer than we have. What right do we have to hunt them to extinction? What effects would it have on the environment if we did? The ocean’s ecosystems cannot survive without sharks. We must respect these animals and give them the space they need to live. After all, we actually need them a lot more than they need us.